Not only does the Fireball tour give us an almighty line-up each year, but it also gives us some hilarious and down right weird memories. With the Fireball: Fuelling The Tour 2018 coming soon, we thought we'd check in with the Fireball team to give us their favourite stories of tours gone by. During the first ever Fireball Tour, everyone got a night off, well, everyone apart from Mariachi El Bronx, who were playing a show as their counterparts, The Bronx, with Matt Stocks filling in on DJ duties for the show as well. Unfortunately, Matt had one too many drinks, got absolutely wild drunk and didn’t go to bed. After a difficult journey to Newcastle the next day, he powered through, had a few more beers and decided it’d be a brilliant idea to somehow mix ‘Holiday In Cambodia’ and ‘Scatman John’ during his DJ set to toast the toon. He went about his DJ duties and as he was about to drop the mix as the last song, the guitar tech for the headliners sound checked over the top of the track. Matt panicked (this was his moment after all) and decided the correct course of action was to grind on the guitar tech in front of a sold out O2 Academy Newcastle. Yep, really. As he suffered with the worst hangover of his life the next day, we made it even more unbearable by making him wear the poncho of shame for the rest of tour and forced him to release this apology video. What’s better than mixing your favourite band with one of the world’s greatest food creations? When the Fireball Tour hit Glasgow, some very lucky competition winners got to hang out with Less Than Jake at local restaurant, Bloc+, who ever so kindly made their own Fireball glazed burgers for the session. Some tours end by swapping merch, having some drinks or going out on the town. Not the Fireball Tour. Every single year we have a cake throwing party to end the tour. Touring can be hard, everyone has very little sleep and we all need to let our hair down by the time it comes to an end, and sugar is of course a great way to get a much-needed injection of energy. We just prefer to have that sugar delivered by hand, to the face. At O2 Academy Bournemouth on the first Fireball tour, the venue put on an amazing spread for all the bands and crew, including a lovely cake in the shape of a bottle of Fireball. 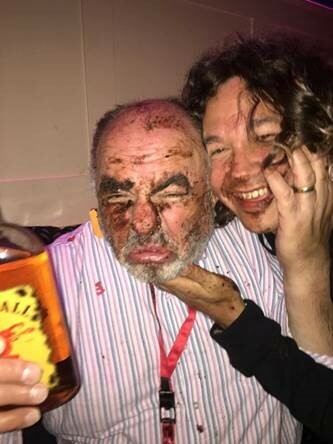 Head promoter, Ian Richards had just given a very pleasant speech, to which we all toasted with a shot of Fireball and then BAM, he gets a cake to the face. We then turned the below photo of his caked face into the tour lanyard the following year. After that, it became a yearly tradition and there are always rumours of sneak cake attacks throughout, but no matter what, on the last day, everyone gets a cake to the face, there’s no escaping it! Oh look, it’s Matt Stocks again. Don’t get us wrong, Matt’s a great guy. But his outfit choices are questionable. To this day, nobody is really sure why he was dressed as a sailor on the first tour, we never saw him take the hat off and word on the street was it was surgically attached to his head (it wasn’t). During the second Fireball Tour he turned up in an IT clown costume, again, no idea why and the film had already been out eight months so it wasn’t even that relevant. So, as we head towards the Fireball Tour 2018, all bets are on as to what he’ll come dressed as this year. People are currently speculating that it’ll be a leprechaun, or Mr Blobby, or maybe even an astronaut, hell it could even be a Deal Or No Deal Box, we wouldn’t put it past him. 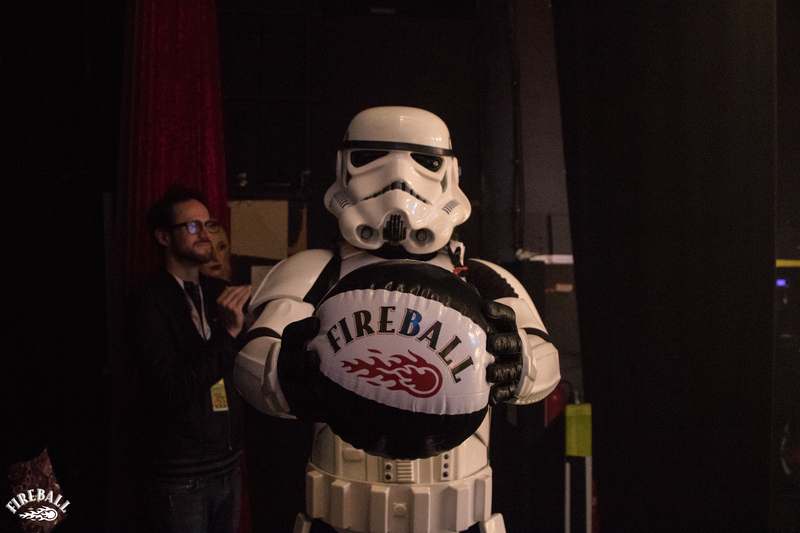 Every night on the tour, we release 100 Fireball beachballs into the crowd for them to have some fun with. “But how do all the beachballs get blown up?” we here you ask, well the bands have got to be useful for something. So this year, when you’re lobbing a ball in someone’s face during Flogging Molly, spare a thought for all the dizzy heads that suffered for your fun earlier on in the day. Want to join in the fun? Come along to the Fireball: Fuelling The Fire Tour and watch as more outrageous things happen both on and off stage.